Put your best paw forward.With neighborhood fireworks going off, Farfel and Bob high-tail it to Bob's basement. Hiding out, Farfel's hunting prowess again lands Bob in hot water with his human, Marcia.Farfel means well. He just can't help it. A mouse is meant to be caught!Appalled at the corpse the cats deliver to her, Marcia searches for a natural solution to her rodent problem, while Bob searches for his inner mouser. Is he cat enough to defend his human's home, like Farfel? Or is he destined to remain Marcia's beloved pacifist forever?Farfel and Bob's Super Stressful Weekend is the second story in a lighthearted series that features text and comic slides for adults. 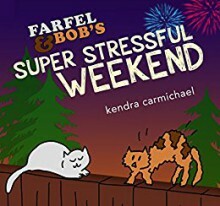 Author Kendra Carmichael continues to adapt her love of hilarious felines and tales of friendship in the second book of the Farfel and Bob series.Buy the book to experience the next chapter in the cat bromance saga today!